Our ACUVUE 2 brand lenses are characterised by outstanding quality of vision and high levels of comfort. 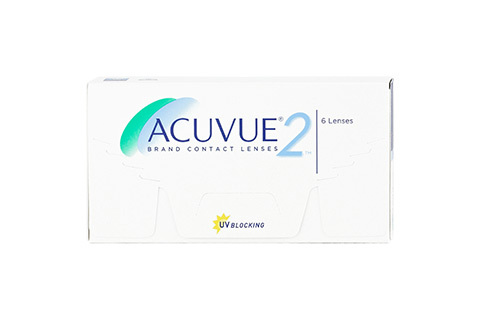 The ACUVUE 2 lens has excellent oxygen permeability levels and is comfortable from the moment you put it in. The comparatively low water content of ACUVUE 2 contact lenses protects the eyes from drying out quickly and guarantees a comfortable wearing experience, even when the lenses are worn for long periods of time. The practical 1-2-3 labelling system of ACUVUE 2 contact lenses prevents you from putting the lenses in incorrectly. In addition, the stable material used to make the lenses, helps to prevent them from folding over whilst being on your finger. The super-thin edges of ACUVUE 2 lenses prevent them from bothering your eyelids and enable the lenses to sit comfortably and stably on the eye, offering an outstanding quality of vision. In addition, the 2-week cycle prevents the formation of protein and lipid deposits. You simply dispose of the lenses and insert new ones, before the deposits have time to form. ACUVUE 2 contact lenses are available in two base curves from Mister Spex, as well as tinted with the name ACUVUE 2 Colours. Take a look at our bundle offers in the Mister Spex online store, which include ACUVUE 2 and the accompanying care solution. Mister Spex advises all online purchasers of ACUVUE 2 contact lenses: the contact lenses, ACUVUE 2, should always be fitted to your eyes by an eye doctor or optician. The period between fittings, unless otherwise prescribed by an eye doctor or optician, should not exceed 6 months. You should go for regular check-ups. You should also strictly follow the recommended wearing time from the manufacturer Johnson & Johnson/your eye doctor/optician for ACUVUE 2 contact lenses. It is your own personal responsibility to make yourself aware of the care instructions for ACUVUE 2 contact lenses and to follow them accordingly. In case of eye irritation or visual impairments while wearing ACUVUE 2, remove the contact lenses immediately and consult an eye doctor or optician. Failure to comply with these safety precautions can cause permanent damage to your eyes and vision.